Q: The US Treasury Department said that it is still concerned about the depreciation of China's yuan and that it is looking for signs of manipulation. Do you have any comment on that? A: I have seen relevant reports. I just want to reiterate that China's position and attitude on the issue of the RMB exchange rate is quite clear. 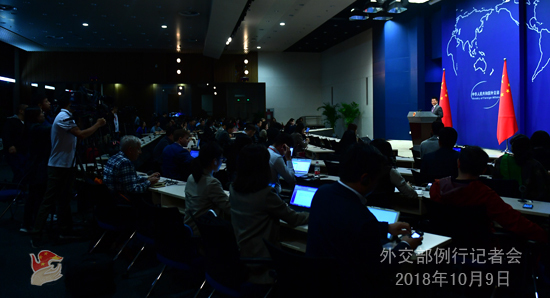 We do not intend to stimulate our exports through competitive currency depreciation, nor will we use the RMB exchange rate as a tool to tackle disputes in trade and other economic fields. I also want to add that the statements you cited are irresponsible as they are just baseless speculations. Q: US leaders recently accused China of interfering in their country's domestic affairs and elections. We noted that State Councilor and Foreign Minister Wang Yi refuted that again in his meeting with US Secretary of State Mike Pompeo yesterday. Do you have more details? A: China has made clear its stern position from the outset on these groundless accusations by the US leaders. We believe that these baseless statements came out of thin air and are unacceptable. Like you said, when meeting with US Secretary of State Pompeo yesterday, State Councilor and Foreign Minister Wang Yi stressed that China holds nothing back and has a clear conscience on this issue. China has stayed committed to the principle of non-interference in others' domestic affairs. Besides, we are not interested in interfering in US domestic affairs and elections. As to what the US said about China using tariffs to influence its elections, the fact is very clear: the trade friction is provoked by the US side alone and the Chinese side is forced to make necessary response. What we've done is legitimate defensive countermeasures. As we pointed out many times, there is no winner in a trade war. As the US levels tariffs on more and more Chinese imports, more industries and regions in the US are bound to be impacted by China's countermeasures, regardless of which party they pledge allegiance. The US side also claimed that China is interfering in its domestic affairs because Chinese media published articles on paid inserts in local newspapers. But the fact is that this is legal and normal cooperation between Chinese and American media which does not violate US laws. Many foreign media also do that. It is absolutely far-fetched and untenable to describe normal exchange and cooperation between China and the US as interference in US domestic politics and elections. Even many US media agencies and American people from different walks of life find such accusations by their leaders unbelievable and absurd. The international community already has its answer when it comes to which country interferes in others' domestic affairs without hesitation. 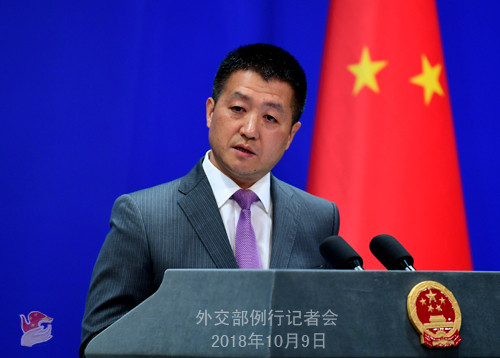 We urge the US side to stop its unfounded slanders and accusations against China, stop its interference in others' domestic affairs, and stop saying or doing anything detrimental to China-US relations. Q: According to reports, Pakistan's Railway Minister has recently said that Pakistan has reduced the loan from China under the CPEC for rail projects by 2 billion dollars. He also said that he wishes to further reduce the cost by another 2 billion dollars if need be. He said that Pakistan is doing this because it cannot afford huge loans and Pakistan's eyes and ears are open. Last week, Pakistan's Prime Minister Imran Khan said that his government is reviewing the CPEC project. So, do you think all these developments give credence to the earlier news reports that Pakistan is having a rethink on CPEC? What is your comment? A: You may just have noticed some aspects of the media reports. Recently we did notice various media reports on the building of the CPEC citing different sources. The fact is that if you could adopt a comprehensive perspective regarding the new Pakistani government's attitude towards the CPEC, you will notice that the Pakistani government under the leadership of Prime Minister Imran Khan continues to voice their support for the CPEC which they believe serves the long-term development of their country. A staff team from the International Monetary Fund (IMF) also made it clear that Pakistan's debt burden is not caused by relevant cooperation projects of the CPEC. On the contrary, the CPEC will strengthen Pakistan's capability for development over the long haul, as the IMF team pointed out. I still believe it is important to know that the CPEC is conducive to enhancing connectivity and realizing enduring prosperity in the region. This certainly conforms with the interests of Pakistan and other regional countries. Since its inception, the CPEC, as an important project of the Belt and Road Initiative, has been advanced by the Chinese and Pakistani governments under the principle of consultation and contribution for shared benefits. Everyone should recognize that. All the issues that you just raised, including how to choose projects and make financing arrangements, are determined by the Chinese and Pakistani governments together through equal consultation. Q: You announced yesterday that Norwegian King Harald V will be visiting China. Could you tell us more about King Harald V's visit to China? How does China see its relations with Norway at this point? What are China's expectations for this visit? A: At the invitation of President Xi Jinping, King Harald V of the Kingdom of Norway will pay a state visit to China from October 11 to 20. According to the schedule agreed by the two sides, President Xi Jinping and Madam Peng Liyuan will host a welcoming ceremony and banquet for King Harald V and his wife. President Xi Jinping will hold talks with King Harald V. Chairman of the NPC Standing Committee Li Zhanshu and other leaders will meet with him. Besides Beijing, King Harald V will also visit Gansu, Shanghai and Jiangsu. Regarding specific information, we will release it in due course. As to China-Norway relations, Norway is one of the first Western countries to establish diplomatic ties with the new China. The China-Norway bilateral cooperation enjoys solid foundation and broad prospects. The Chinese side believes that this visit will serve as an important opportunity to help the two sides further improve bilateral political mutual trust, expand practical cooperation, enhance the traditional friendship between the two peoples, and move forward China-Norway relations.